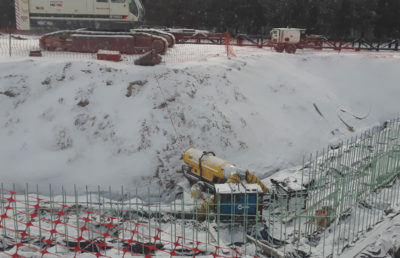 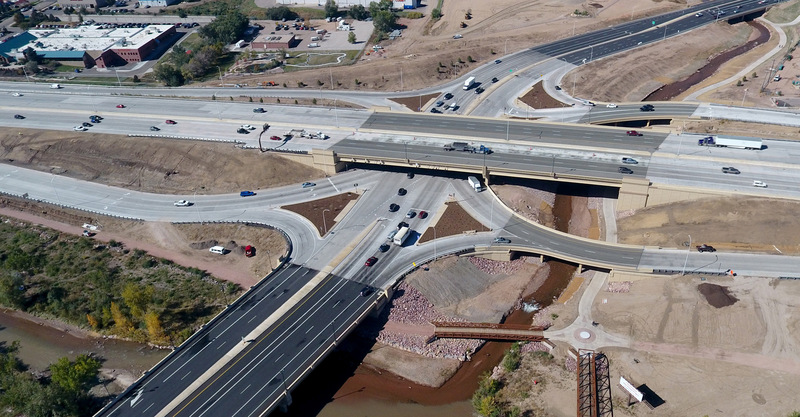 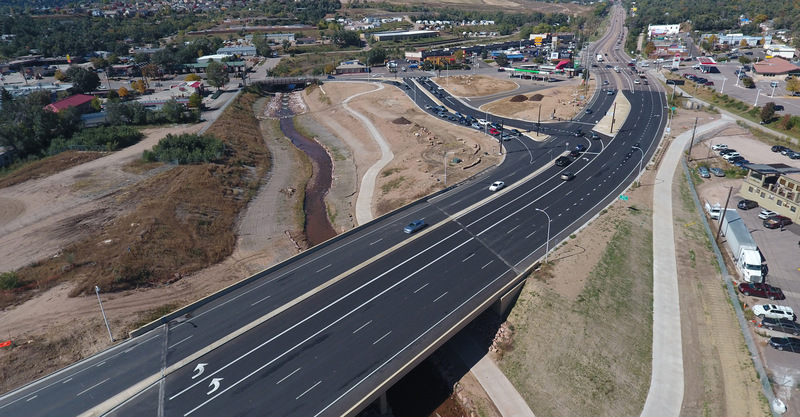 RS&H served as engineering design lead to Kraemer North America for the I-25/Cimarron (US 24) Interchange, the second largest highway construction project in the Pikes Peak region. 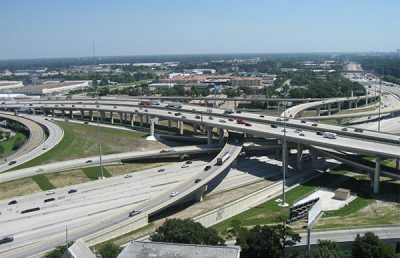 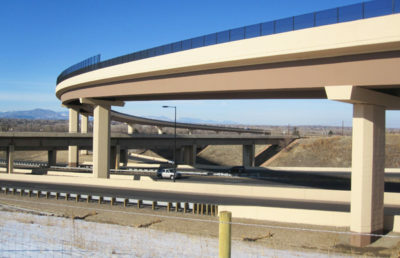 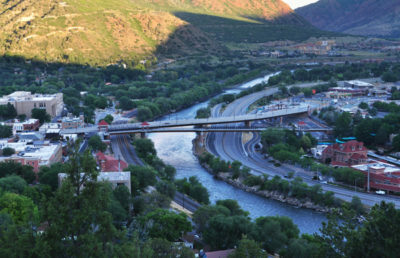 The complicated reconstruction, which consisted of converting the interchange to a Single Point Urban Interchange (SPUI), included realignment of the I-25 mainline and US 24, three thru-lanes with auxiliary lanes in each direction, ramp lanes, a quadrant intersection, design of seven bridges, retaining walls and structures, restoration and realignment of 2,200 feet of degraded stream channel, over 1 mile of new multi-use trails, and significant utility relocations and upgrades. 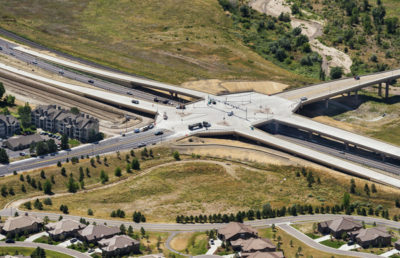 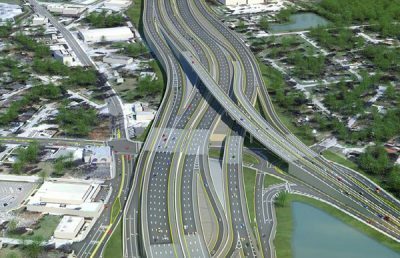 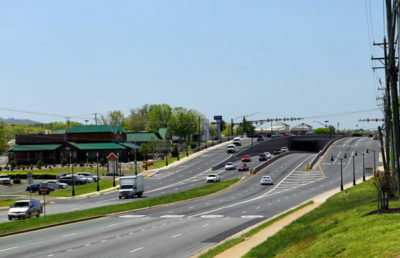 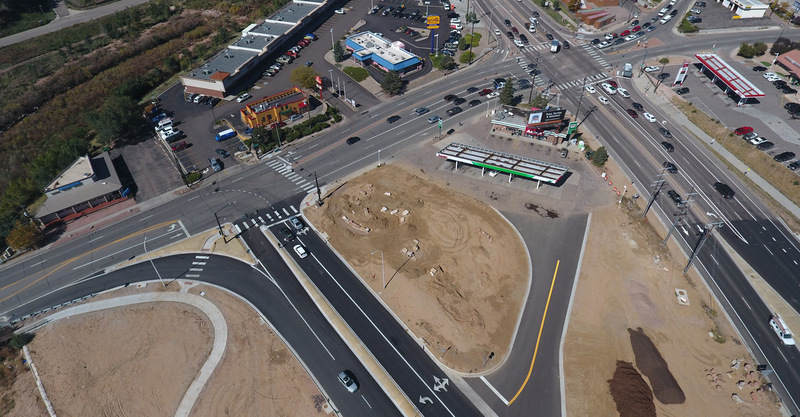 The design-build process allowed our team to modify the interchange configuration by adding a unique quadrant intersection at the adjacent 8th Street intersection. 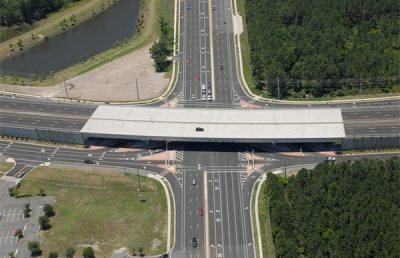 This solution separates left turns from through traffic, resulting in a continuous flow intersection that addresses weekend traffic congestion. 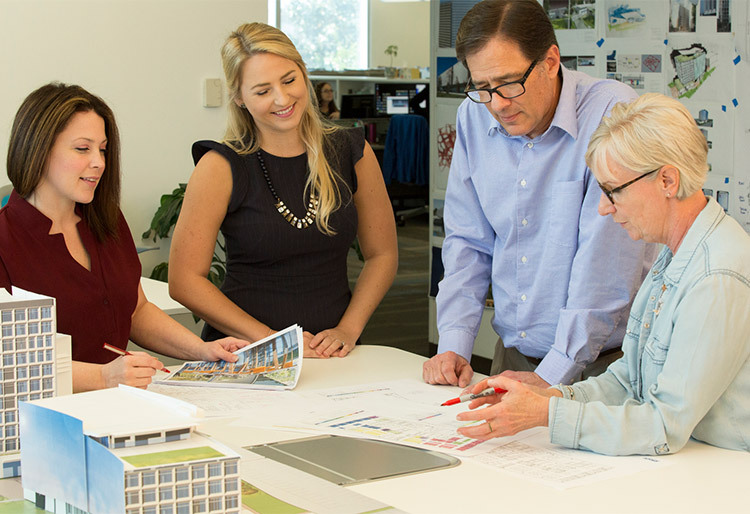 Due to high traffic volumes, limited space for phasing, and the location of Fountain and Monument Creeks, design and phasing of this project were quite challenging. 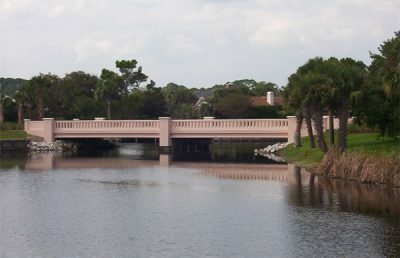 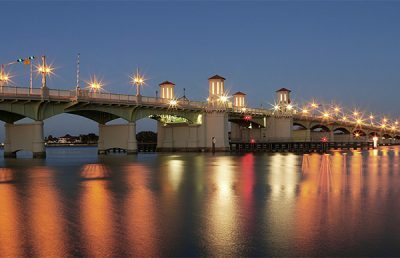 To overcome these obstacles, RS&H designed five separate bridge types for the seven bridges, each chosen for its constructability, cost, and site constraints. 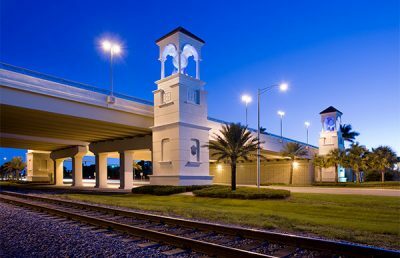 Careful attention to the details allowed the structures to visually match each other and meet the overall project vision. 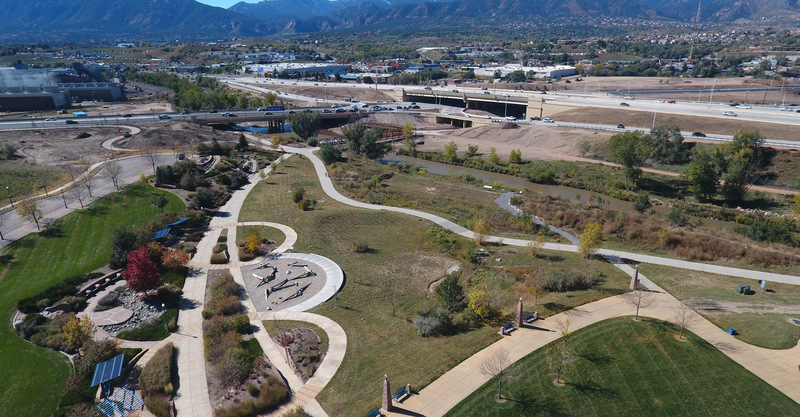 The project included trail realignment and extension, as well as a bicycle roundabout at a major trail convergence. 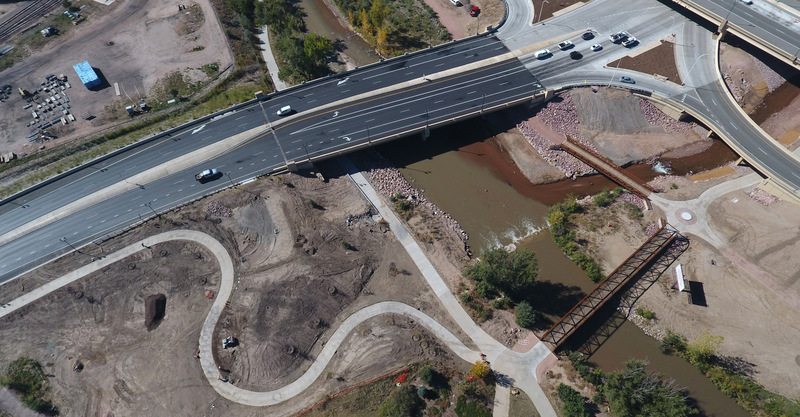 One new pedestrian bridge spanning Monument Creek was added, and another spanning Fountain Creek was replaced. 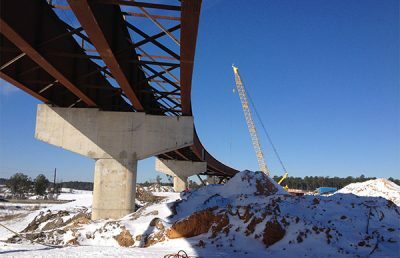 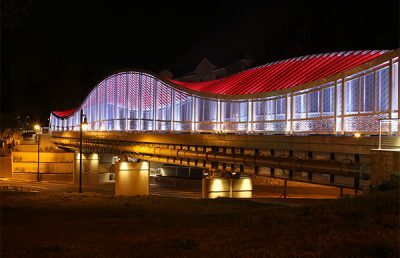 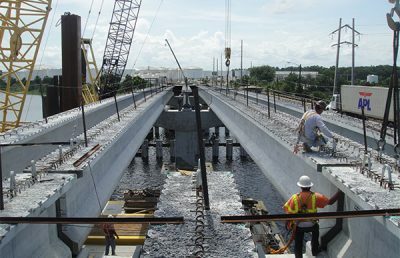 Both bridges were prefabricated with RS&H completing design of supporting structural elements, trail alignment, drainage, and utility coordination. 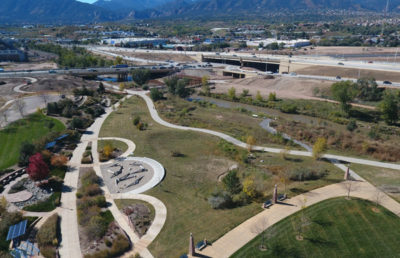 Aesthetics and landscaping were a major consideration during design of the trail and bridges. 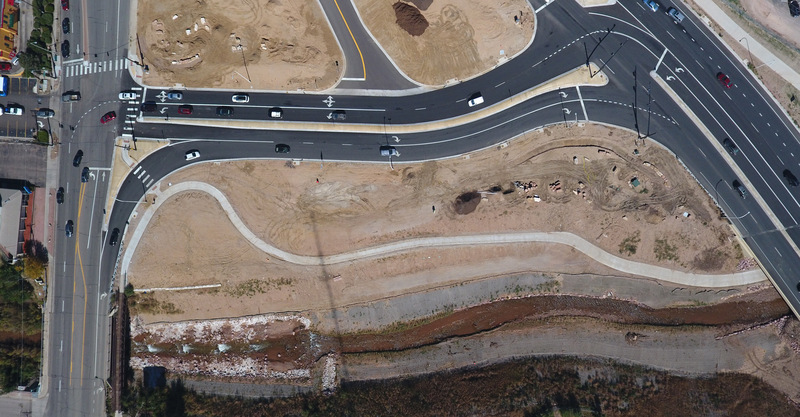 The project also included transitioning on-street bike lanes to the trail system. 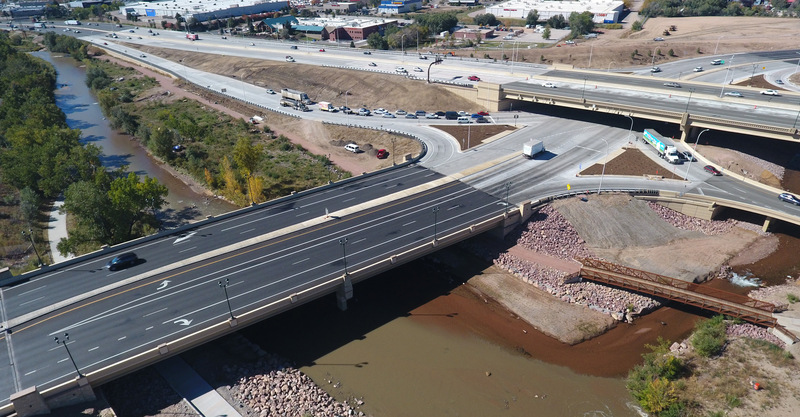 RS&H designed roadway drainage improvements, including approximately 12,000 linear feet of storm sewer, 26 manholes, 120 inlets, and three water quality facilities. 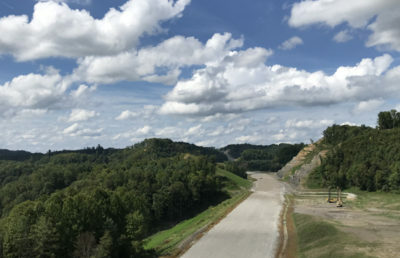 The project also included the design of 2,200 linear feet of stream realignment and restoration, including environmental coordination and floodplain permitting. 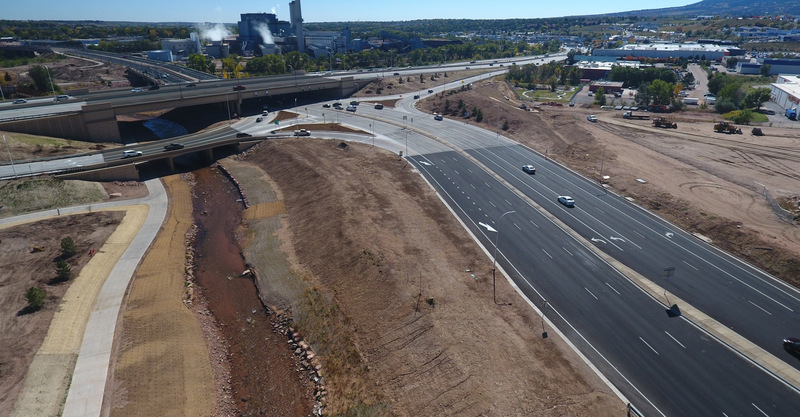 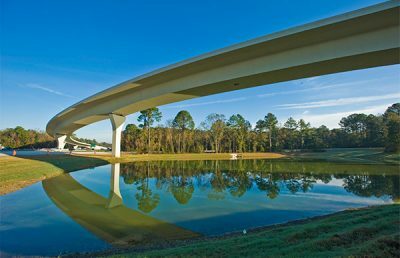 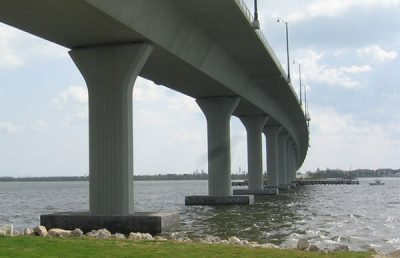 RS&H hydraulic engineers performed design and analysis of seven stream crossings (five roadway and two pedestrian bridges) using one-dimensional and two-dimensional modeling. 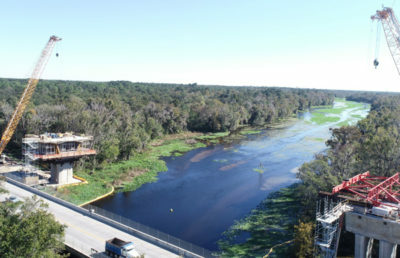 Stream channel restoration incorporated fish habitat and elements to facilitate fish passage. 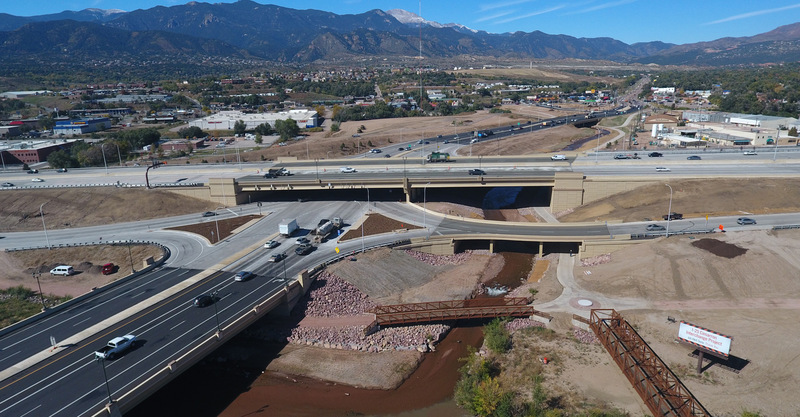 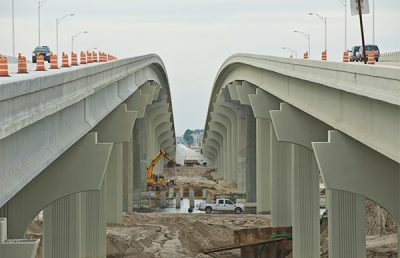 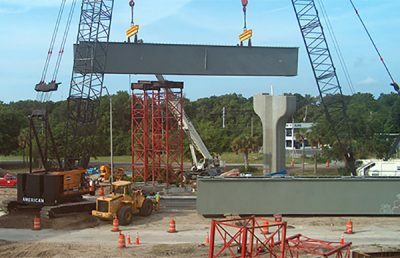 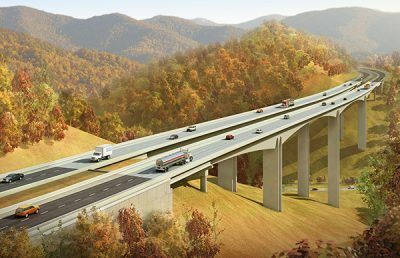 To maximize the improvements that could be constructed within the project’s fixed budget, the team optimized bridge design and channel hydraulics to provide economical, yet highly architectural bridges that meet the hydraulic requirements. 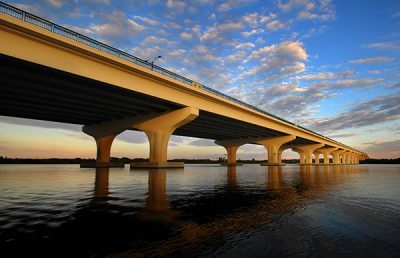 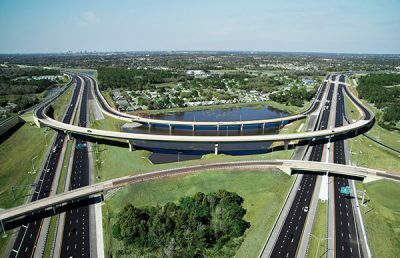 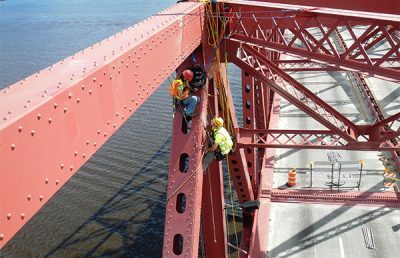 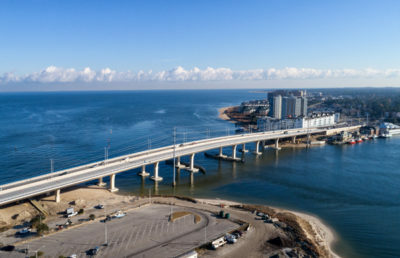 Working with stakeholders, five of the bridges were designed above the 100-year water surface elevation while two were designed to pass 10-year flows and breakaway in larger events. 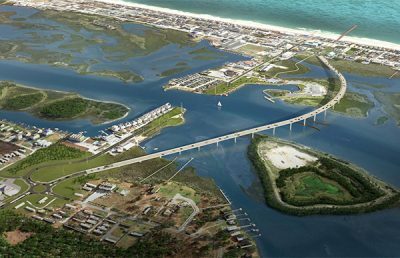 This collaborative approach allowed for the best overall solution, balancing flood risks with pedestrian access requirements.